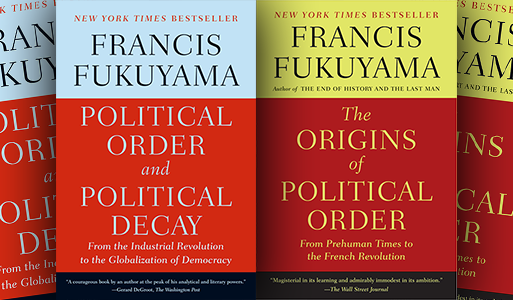 Francis Fukuyama, The Origins of Political Order: From Prehuman Times to the French Revolution. New York: Farrar, Straus and Giroux, 2011. 585 pages. Francis Fukuyama, Political Order and Political Decay: From the Industrial Revolution to the Globalization of Democracy. New York: Farrar, Straus and Giroux, 2014. 672 pages. When I talk to friends about these books the reaction tends to be “Fukuyama? The guy who predicted the end of history? Yeah, look how that turned out.” Or “Isn’t he a neocon?” This review is a plea to anyone, no matter your politics, interested in why humans behave the way we do: read these books. Fukuyama is no cardboard-cutout conservative. He targets established thinking across the spectrum and in the process lays out a framework for a genuinely radical new way of analyzing politics that is grounded in history. Whether you are a Sanders socialist or a red tory or a free marketeer, you will find ideas to like here, and many more to challenge you. Francis Fukuyama’s best-known work is “The End of History and the Last Man” (the title a half-joking nod to Hegel), an essay and then book published in the flush of the just-post-Cold-War. In it he argued that liberal capitalist democracy marked an end to political evolution. We were all “pointing toward Denmark” – on the escalator toward a peaceable, well-governed, equitable democracy. All roads led to elections, to restrained markets, to the rule of law. While 21st-century winds have frayed Fukuyama’s flag, he was on to something. Today’s worst dictators want the legitimacy of elections and call themselves democrats, preferring the title of President or Prime Minister to Emperor or General. They pass laws against corruption, even while never quite getting around to enforcing them. There is no serious competition to capitalism. The acceptable economic spectrum ranges from Chinese capitalism to rapacious kleptocracies to social democracies with large, if creaking, welfare states. There are arguments over how to collect and spend the money made from market economies, but no serious debate over whether they should exist. At the same time, however, an aggressively illiberal and expansionist Russia is resurgent, controlling the press, rigging its own elections and, increasingly, interfering in other countries. Communist China continues its rise to dominance, taking ownership over great washes of the South China Sea far outside its recognized areas of control. Not a day passed in the American presidential campaign without Donald Trump comparing strong Chinese GDP growth to a stagnant United States. Yes, the comparison further demonstrated Trump’s economic illiteracy, but it also spoke to a malaise about the broader West. Western institutions and alliances are weakening. The U.K. voted to withdraw from the European Union, and that same Union saw its flagship free trade deal with Canada nearly destroyed by opponents from the tiny Belgian region of Wallonia. This raises the question: If Europe can’t agree that Canada is a good trading partner, who would qualify? Thuggish Philippine President Rodrigo Duterte, who has excused more than 4,000 extrajudicial killings since his election last May, announced in October that his country was “separating” from the United States and “there are three of us against the world – China, Philippines and Russia. It’s the only way.” Hungary’s Prime Minister, Viktor Orbán, talks of building an “illiberal democracy” based on nationalism as much as consent by the governed. Perhaps more than Oslo’s tidy boutiques, the renovated police dungeons of Moscow seem to be the political ornaments of our time. International weakness is matched by domestic unease within established democracies. Growing concerns about inequality, expressed in popular anger against elites, are met with incomprehension by established parties of the left and right. Twentieth-century policy tools, including the universal education, public health care and old age security programs that lifted millions from poverty, are now taken for granted. Citizens look to their ever-richer elites and ask: what’s next? A quarter century has passed since the End of History and the road to Denmark is getting bumpier. In these two volumes Fukuyama doesn’t tell us what’s next, but he gives us the full, sweeping context of where we have been and shares worries about the future. He presents, in page after densely packed page, the topography of human history. The depth of these books is impressive, the vast bibliographies are testament to Fukuyama’s scholarship and the clear writing makes his work accessible to the general – if committed – reader. Every paragraph is packed with observations that spill into conversation long after you put the books down. Anecdotes about stew made from the bodies of defeated enemies and the role of slave soldiers in building the Ottoman Empire linger with you. They are mixed with respectful but forensic dissections of other scholars’ work: Rousseau, Hobbes, Marx, Hayek, Diamond all applauded for what they got right and corrected where they went astray, with their surviving conclusions carefully added to the foundations of Fukuyama’s argument. Given the scope of the work and Fukuyama’s biography, which presents those on the left with a good many obstacles, I expected to quickly trip over the author’s biases. Instead, his evidence-based approach to the vast literature on human social development is one of the books’ most impressive characteristics. Occasional assertions go unsupported, for example his dismissal of the idea that humans are inherently cooperative. The evidence for this idea might not be convincing but, in such an already long book, a few sentences backing up his dismissal would not have been upsetting. This is a small complaint. Born in Chicago in 1952 and raised in New York, Fukuyama picked up degrees from Cornell and Harvard, spending time in Paris under the postmodernist Jacques Derrida before completing his studies with Samuel P. Huntington, who became his mentor (and whose 1968 Political Order in Changing Societies inspired these books). He went on to work for think tanks and Ronald Reagan’s State Department, quickly establishing himself as a voice of the emerging neoconservative movement. Fukuyama has moderated and refined his views over the last 20 years, breaking with the neocons over the Iraq War, which he had initially supported. He acknowledged that “The End of History” had been too quick to slam postmodernism for every modern sin and too slow to see the need to recognize the importance of culture when promoting limited government and the market. These books end up being neither left- nor right-wing. They’re rooted in Enlightenment values of openness, and share a spirit of optimistic realism with U.S. Progressives of the early 20th century: any problem can be fixed if we understand it. The first volume works through the common threads that link the creation of different states. Fukuyama starts by pulling apart the obvious but often unexamined error at the heart of modern philosophy and political science: the competing theories on the origin of political order are clearly, completely, wrong. Contra Rousseau, humans were not solitary creatures enslaved by civilization. Contra Hobbes, they were not engaged in a war of all against all. We know from anthropology, primatology and other fields that humans are social animals, evolved from social animals, and this biological root needs to be the starting point for study of our species’ growth. Without knowing the exact behaviour of early humans, Fukuyama draws on studies of patronage and political behaviour in chimpanzees before looking to contemporary examples of simpler social structures, such as dispersed kin groups in Papua New Guinea’s highlands, where extended families live in tight-knit communities separated by mountain ranges that divide communities as much as any ocean. These communities are relatively egalitarian; leadership is based on ability, not heredity; there are customs but no laws or impartial justice; and by definition they never grow beyond a few hundred members. Kin groups survived the transition to tribes and, in most cases, the transition to states. Population density, geography and other causes play a role, but state formation is primarily a response to organized violence. The threat of physical extinction leads people to give up the relative equality and freedom of kin-based societies and accept hierarchical leadership. Effective defence is Fukuyama’s first pillar. The group able to match or exceed the military, tax-collecting and agricultural efficiency of an aggressor is likely to prevail. For Wittfogel’s hypothesis to be true, we would have to imagine a group of tribesman getting together one day and saying to each other: “We could become a lot richer if we turned over our cherished freedom to a dictator, who would be responsible for managing a huge hydraulic-engineering project, the likes of which the world has never seen before. And we will give up that freedom … for all time, because future generations will need a good project manager as well.” If this scenario were plausible, the European Union would have turned into a state long ago. Fukuyama points out our bias toward building intellectual theories on physical evidence: ideas and religious thoughts don’t persist in the same way as temples, dams and spears. We focus our interest on the single castle that endures at the expense of 10,000 wooden houses that rotted away. Fukuyama looks for similar, if less obvious, bias in other theories. Not surprisingly he targets modernization theory, long the target of his mentor, Huntington. Modernization theory was wrong to assert that politics, economics and culture evolve in lockstep, moving neatly from one phase to the next. Fukuyama shows that those transitions are mostly messy and incomplete, and European modernists, in theories of state formation as in other disciplines, imposed their uniquely European experience on the rest of the world. China, which solidified into something close to its modern borders and culture over 2,000 years ago, shows the modernists’ error. Constant warfare cracked and broke apart more than 3,000 polities between 2000 and 200 BCE, mixing them together until they became one. There was no time for the development of trader or peasant classes, or for anything but the preparation of defences against the next attack from a neighbour. China was the first state but it has yet to develop the rule of law, Fukuyama’s second pillar, or his third, accountable institutions. China did have legalist systems including Confucianism, based on the family and tradition, and the poorly named Legalism, which saw the state imposing brutally one-sided obligations. Confucianism encouraged obedience through a dense mesh of social connections and pressures. Legalism encouraged obedience by torturing or killing those who stood against the state. These competing strains of codified oppression have marked the boundaries of Chinese political life to the present, when the Communist Party exerts unrestrained power through the Basic Law, which allows the Party to overturn legal decisions. Western Europe developed slowly (seemingly established powers like Germany, Italy and Sweden have only existed in modern forms for about as long as Canada), but overarching legal codes imposed by the Catholic Church allowed the rule of law to come into force at an early date, independent from local political power. The church, behaving like a state itself, struggled with proto-nation-states, with individual Europeans the target. For the first time in the history of our species, power structures competed for the loyalty of very ordinary people. States offered competing legal systems and, starting with the Reformation and the creation of the Church of England, competing faiths. Rulers won loyalty from their subjects by insisting they were subject to the law, not above it. This contest had unintended consequences. At the start of the second millennium, as the Catholic Church competed with Christian princes and kings, Rome developed laws that allowed spinsters to own and widows to inherit property. Instead of passing to in-laws, where it was within reach of a king’s power to tax and seize, property could go directly to the church on the widow’s death, weakening family lineages. Indulgences and other scams vacuumed up money and property from those freed from family control. The universal church had accidentally created individuals, with political and economic rights before the law, as well as rights for women. One unexplored avenue opens when Fukuyama says, “State building concentrates political power, while rule of law limits it.” It would be accurate to say the rule of law focuses power, as well as limiting it – the more freedoms were protected, the more trust rulers gained over the ruled, and the more power they could exercise in those areas open to them. This virtuous feedback led to the development of Fukuyama’s third pillar, accountable government, which should not be confused with democracy. Multiparty elections are the most common means of holding the government to account, but not the only one; Fukuyama cites the King of Jordan, who has successfully juggled different interest groups and maintained broad support despite the absence of anything approaching a genuine democracy. Where the first volume shows the evolution of the state, the second looks at how a planet of competing states has behaved in the two centuries since the start of the Industrial Revolution. Successful states must be able to defend their borders, live under the rule of law and have accountable institutions. That leads them to maturity, when they fall prey to political decay. Throughout both volumes Fukuyama uses the inelegant if accurate term repatrimonialization to refer to the process of elites seeking to overcome the limitations imposed by the state, the rule of law and accountable institutions and return to the inherent human tendency of rewarding friends and relatives, regardless of their merit or the consequences. To Fukuyama this is something close to humanity’s Original Sin, a drive so powerful that every idea on improving government has to be considered in its light. Examples of repatrimonialization range from the perpetuation of hereditary royal families in early tribal societies to the complex clientelism of the 19th-century United States. The second volume digs into examples of astonishing acts of graft and corruption in the goal of helping friends and family. The colonial powers’ conquests in Latin America were marked by their strong if decadent institutions: “As settlement colonies, they tended to replicate the class-based, mercantilist society found back on the Iberian peninsula, in which indigenous laborers and mestizos took the place of the white European peasantry.” In Asia, strong local institutions absorbed elements of the colonial culture and incorporated them into traditional structures. Artificial creations like French Indochina reverted to the independent states of Laos, Cambodia and Vietnam. When considering the growth of democracy, Fukuyama embraces elements of Marx: democracy requires a middle class and usually emerges from a bourgeoisie looking to protect its interests against a rapacious elite and the threat of revolt from peasants and workers. The fact that a protected middle class grew steadily wealthier, expanding to include more and more of the population who were then afforded the same protections, was a positive but unplanned consequence of a group acting out of self-interest. As someone with a self-interest in political parties, I found it gratifying to see those structures given their due. Too often parties are ignored in favour of the close study of institutions and philosophies, and their central role in mediating conflicting people and ideas is overlooked. The ability of small groups to advance new ways of tackling problems, and then to be given the opportunity to take control of state institutions without destroying, recreating or coopting them, is to me the operational Rosetta Stone at the heart of liberal democracy. Fukuyama has reassuring words for Arab reformers despondent at the near-complete failure of the Arab Spring, noting that in the years after the revolutions of 1848 most of the countries that had experienced uprisings underwent periods of conservative repression. He reminds us that progress is slow and messy, and that even in established democracies democratic rights had to be fought for, often violently, against the wishes of established elites. This optimism seems to disappear as the book closes. Traditional arguments against democracy are looked at and dispensed with. Fukuyama’s concerns are in the future, not the past. With the success of the welfare state and ever expanding human lifespans, will democracy survive in countries filled with entitled centenarians? Malthus – dismissed in the first volume for ideas on the limits of population growth that were destroyed by the explosion in productivity brought about by the Industrial Revolution – is resurrected. Limits may reappear in the face of declining productivity, longer lives and longer retirements. Fukuyama’s writing on technology explores its dangers to democracy. Once humans can alter the course of evolution, there is a risk of destroying social equality. If intelligence, strength and other desirable attributes become market commodities, those commodities will be acquired by the wealthy and powerful. We may see not just an economically dominant class but a virtually new species: homo sapiens 2.0. The size and success of government programs are themselves a problem. Following the iron law of entropy all systems degrade, and following the iron law of bureaucracy all governments protect themselves from cuts and work to expand their powers. It is much easier to add a government program than to eliminate one. Fukuyama asserts that “there is … too much law and too much ‘democracy’ relative to American state capacity.” While courts have allowed every decision to be endlessly litigated, Congress has become thoroughly repatrimonialized, not through the direct vote-buying associated with the clientelist era but through the rise of interest groups that are allowed to purchase access to and control over elected officials via donations to candidates and parties. This problem is particularly acute in the United States but diluted versions exist in, for example, Canadian political parties, whose donor and activist lists are dominated by trade unions, industry groups and the organized voices of minority communities. This group control is not surprising in light of the overall decline in citizen participation in public life. As a result, it is harder for today’s middle class to defend itself against threats from above or below. Class solidarity grew more naturally during the industrial period. As impersonal as that world was in terms of subservience to machines, it was intimate in the literal sense: company towns with thousands of people working in a single factory, mine or mill, doing similar or identical work. Today’s diversified economy offers many advantages, but social cohesion is not one of them. Similarly, there is increasing resentment toward an elite that has grown astronomically wealthy and its perceived collusion with a political class that today manages wealth rather than engaging the public in great projects that result in concrete improvements in people’s standards of living. As memories of truly severe poverty recede in memory, programs that have been very helpful, like Obamacare, are perceived negatively by those who benefit the most. With many people living in democracies, or wanting to (save a relative handful of deluded young people you don’t see floods of refugees rushing to live in Saudi Arabia), it is hard today to envisage a return to broadly authoritarian or totalitarian rule. But we should not be complacent. What Fukuyama terms the “vetocracy” has replaced a functioning system of checks and balances that was long at the heart of American democracy. Increasingly politics is a zero-sum game where politicians on each side accuse the other of being responsible for all that ails the country. The United States is not alone in falling prey to this strident populism. Writing in Foreign Affairs last summer, Fukuyama updated the concerns that close out these books.1 A shock to the economy or social fabric could be enough to shatter already fragile institutions. Voters may elect populists who will unarguably undermine their standard of living – not out of an effort to undermine democratic institutions, but out of a sense that no one is listening to them and their vote is their only tool for expressing their anger at being ignored. The Republicans listen only to the wealthy; Democrats listen only to minorities. White working people who continue to make up a large part of the population believe they have no voice: hence their support for Trump. In the U.K., those same people voted to leave the European Union. It is only a matter of time before this wave reaches Canada. Fukuyama concludes by maintaining his commitment to democracy, continuing to argue that we should keep on walking down that road to Denmark. Fittingly for someone who maintains the importance of political alongside, but independent of, economic and social development, he advocates some evidence-based solutions which, as a centrist social democrat, I find appealing. He praises German policies, which stress efficiency in production, providing more money to be inefficient, but more egalitarian, in wages. This may annoy some economists but it maintains a social coalition to support your state. Despite higher labour costs, Germany remains the world’s third biggest exporter. He argues for investment in education, not just for young people but retraining for those displaced by an ever-faster-moving economy. He proposes infrastructure spending à la New Deal. There are obvious criticisms of Fukuyama’s work. There is hubris in tackling the entire history of human political organization in two books – similar to writing a guidebook to the entire planet. To me this is part of the books’ appeal: he is unafraid to aim high, to put forward grand themes, and to do the hard work of reinforcing his thesis, point by point, page by page. When much scholarship has leached out into incomprehensible jargon-filled nonsense, a tightly written book that accepts its own limitations is a welcome change. 1Francis Fukuyama, “American Political Decay or Renewal? 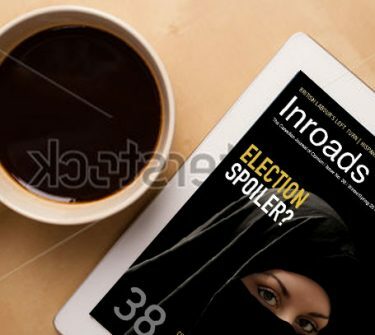 : The Meaning of the 2016 Election,” Forreign Affairs, July/August 2016, retrieved here.